I’ve recently released two new downloadable resources at Studygypsyjazz.com. 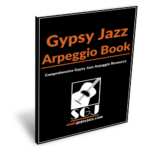 The first is the ‘Gypsy Jazz Arpeggio Book‘, a 150 page PDF featuring over 500 notated arpeggios used in gypsy jazz / Jazz Manouche. This is a great resource for exploring and mastering the guitar neck, and for tackling improvisation over songs in all 12 keys. The PDF comes notated in both TAB and standard notation, and is a great compliment to the previously released ‘Gypsy Jazz Chord Book‘. To check out the two new releases, please visit my online school here. 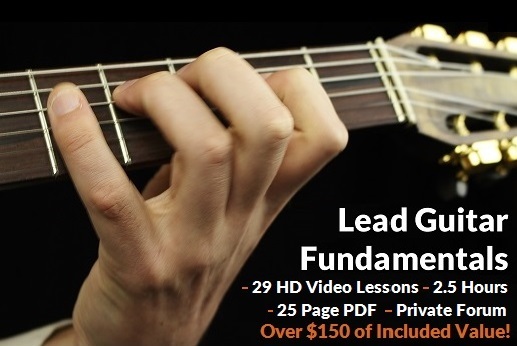 Gypsy Jazz Guitar Course ‘Lead Guitar Fundamentals’ Released! I’m excited to say that my new on-line gypsy jazz guitar course, Lead Guitar Fundamentals, is now available at Studygypsyjazz.com. The course took almost a year to produce, including writing, filming and editing. I’m very happy to be able to share it with you. This course is intended as the ‘other side of the coin,’ so to speak, to my début course gypsy jazz Rhythm Guitar Fundamentals, which was released in April 2015. Together, these two courses offer a comprehensive study of the essential techniques and vocabulary. If you’re interested, you can check out both the courses here! There have been some exciting updates to my online platform for learning gypsy jazz guitar, Studygypsyjazz.com! In other news, there are now over 15 backing tracks for gypsy jazz standards available to stream at Studygypsyjazz.com. You can find these on the backing track page here. I have also released a premium Gypsy Jazz Chord Vamp Backing Track Pack. 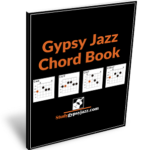 This pack features extended gypsy jazz chord vamps so that students can practice improvising over individual chord types. Please check it out here! Studygypsyjazz.com featured in Guitar World Magazine! www.studygypsyjazz.com has been featured in the online edition of Guitar World, the worlds most popular guitar magazine! The feature article focuses on the debut course I have released at www.studygypsyjazz.com, ‘Rhythm Guitar Fundamentals,’ which deals with the essential technique and chord-vocabulary components of learning gypsy jazz swing rhythm guitar. Learn Gypsy Jazz Online With Harry @ www.studygypsyjazz.com ! Learn gypsy jazz guitar online with Harry! I am very excited to say that the website I have been working on for almost a year for learning gypsy jazz / Jazz Manouche guitar online is now live! Our debut course, ‘Rhythm Guitar Fundamentals,’ is now available for enrolment. If you have a few moments, please ‘like’ our Facebook page to help spread the word! New album available on Band Camp! The new CD of all original compositions by the Harry Edwards Trio is now available via BandCamp! You can order a limited edition signed copy for $20, or download a digital version for $10. Bandcamp is a great platform where nearly all profits go directly to the musicians, which helps us bring the music to you! We are launching the CD in Tasmania with two shows, one in Ulverstone at the Ulverstone Wharf on January 30th, and another in Hobart at the Rosny Barn as part of the Clarence Jazz Festival on February 19th. Hope to see you there. Well our little tour is over. We had a great time. A huge thanks to everyone who came to our gigs, played with us, put us up for the night and gave us petrol money by buying CDs. We hope to do another tour sometime in the near future, so hopefully we’ll see y’all again soon. Our next gig is Sunday dec 21st at MONA, Hobart 1-4pm. Hope to see you there! We are launching our CD in Tasmania with two shows. The first is a north-west launch in Ulverstone at the Ulverstone Wharf on Friday January 30th 2015. The Hobart launch will be at the Rosny Barn as part of the Clarence Jazz Festival on Thursday February 19th. We’re really looking forward to these gigs, please come along if you can!. Well the trio had a great time recording our CD in early October, with the help of the very talented audio engineer George Goerss. We have since had the recordings mixed and mastered by George, and some excellent CD cover and booklet design put together by Milton Andrews at Square Peg Design. Next week we start a mini-tour of of the east coast of Australia to share our music and new CD with people in Melbourne, Canberra, Dubbo, Brisbane, Byron Bay and Toowoomba. The highlight will be our performance at the annual gypsy jazz festival in Brisbane, ‘OzManouche,’ where we will be supporting international gypsy jazz maestro Robin Nolan. That should be fun, and it will be good to meet Robin. Here are the dates for our mainland mission. Hope to see you at one of the shows! We’ll be launching our CD in Tasmania with a Hobart show at the Rosny Barn on Thursday February 19th as part of the Clarence Jazz Festival. We’ll also be doing a north-west Tasmania launch on Friday January 30th at the Ulverstone Wharf. More details to come about those two shows. A few weeks ago I arrived back in Hobart after spending 3 months overseas studying gypsy jazz guitar. I spent most of my time overseas living just outside of Paris, in the suburb Aubervilliers. I also spent a few weeks in the U.S.A. at the start of my trip where I went along to the annual Django in June music camp. It was a great few months, and kind of seems like it was a bit of a dream now that I’m back in Tasmania. I met so many brilliant musicians and went along to countless jam sessions and concerts in Paris, and took many lessons with the world’s leading experts in gypsy jazz style guitar playing. I was very very fortunate to be able to take some lessons from my favorite guitar, Sebastien Giniaux. This was a dream come true for me. Sebastien is such an incredible musician, and a really nice guy too. Some other musicians I had the fortune of studying with while abroad were Mathieu Chatelian, Samy Daussat, Tcha Limberger, Christophe Lartilleux, Thomas Baggerman, Reinier Voet, William Brunard, Romain Vuillemin, Jean-Philippe Watramez, and Antoine Boyer. It is great to be back in Tasmania, where I look forward to sharing what I’ve learnt with students and audiences alike. Whilst away I also purchased a beautiful French-made gypsy jazz guitar, handmade by master guitar luthier Antoine Prabel, who lives just outside of Lyon in France. Antoine and I first met at the Samois-sur-Seine Festival of Django Reinhardt in June this year, where jazz-manouche luthiers annually display their wares. He had one guitar in particular that really left an impression on me, but had already sold. When I visited him in Lyon two months later, he had made me two guitars to try. I walked away with the beautiful model you can see on the homepage of this website, which he named the Tasmanian Tiger because of the characteristic striped that appear on the back of the neck. It is such a beautiful guitar, and a real upgrade from the Gitane I have had since 2010. Whilst away overseas I did quite a bit of songwriting. Writing has always been my core interest as a musician really. I love to play guitar, and to play music with others, but writing original material has always been my main source of enjoyment as a musician. I am excited to announce that we are recording our debut CD next week, with the help of a successful Pozible crowdfunding campaign in partnership with Arts Tasmania. For the recording we are hiring St John’s Church in New Town, Tasmania. This historic church has beautiful acoustics, and I don’t think we could have found a better venue to record our CD. The CD will feature the compositions written during my time in Europe this year, and will be released in early December 2014, followed by a mini tour of Tasmania, and the east coast of Australia. We played two tunes. The first was an original composition named ‘Gadje,’ and we followed this up with Isham Jones’ ‘I’ll see you in my dreams,’ a swing classic, and Django Reinhardt favourite. The Advocate Newspaper also did a short piece on the group (18/03/14) in anticipation of our North-West Tasmania gigs in May. There will be a feature article in the paper closer to the dates (16th – 18th May). I’ve been very fortunate to receive some funding from Arts Tasmania and Regional Arts Tasmania to travel both to the U.S. and Paris in June 2014, to study with some of the world leading Gypsy Jazz guitarists. These two grants will allow me to purse my passion for this music both by funding my tuition, and placing me in countries where Gypsy Jazz thrives. In the states I will be spending a week immersing myself in the New York music scene, checking out as many gigs as I can, before attending ‘Django in June’ (www.djangoinjune.com). This will be a week long camp (June 17th – 22nd) in Northampton, Massachusetts dedicated to the study of this niche genre. It should be amazing, and I highly recommend to any fans and players of this style to check it out. After ‘Django in June,’ I’ll be flying over to Paris to attend the annual Django Reinhardt Festival (www.festivaldjangoreinhardt.com) in Samois (June 25th – 29th). This is the premiere gathering of Manouche artists, in the country where the music was born, and will be a great opportunity to hear and jam with some leading artists in this genre. Following the Samois festival I will be renting accommodation in central Paris, and commencing 2 months of private tuition with 3 professional gypsy jazz musicians, namely Antoine Boyer, Christophe Lartilluex and Samy Daussat. These guys are all brilliant musicians, and I’m sure I’ll get a lot out of it. Living in central Paris will also allow me to see live gypsy jazz performed several times a week. Venues such as Taverne de Cluny, L’atelier Charonne and Bouquet du Nord showcase Manouche music throughout the week, often at no charge to patrons. If I can see guitarist Sebastien Giniaux play at least once, I think my mind will be blown.